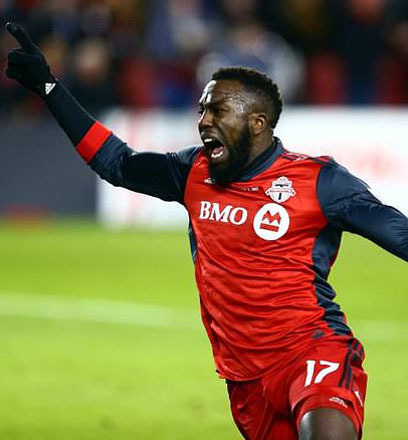 Jozy Altidore scores first Toronto FC goal as team brings home MLS Cup in 2-0 win over Seattle Sounders. Football means one thing in North America, and another in the rest of the world. In the late fall of 2017, as it happens, Toronto, ON, Canada has won what some might reasonably call two football championships — one, as it were, for each of these two current meanings. To start with, only a few weeks ago in an Ottawa snow storm the current incarnation of a team originally invented by the Argonaut Rowing Club on the western Toronto waterfront won its 17th Grey Cup — coveted ultimate trophy of today’s Canadian Football League (CFL). Toronto Argonauts cheerleaders in warmer weather. 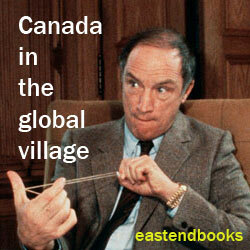 The Argos also won the Grey Cup this year — for a double football championship in the new global city. 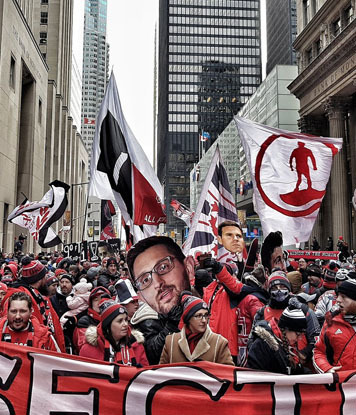 Toronto FC MLS championship victory parade moves up Bay Street. Photo : Emanuele Garau. 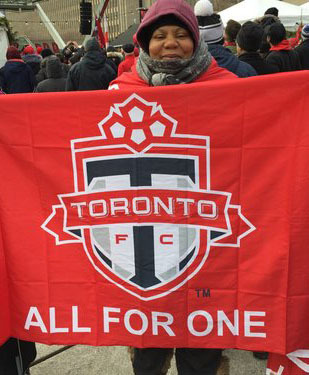 The Toronto FC (where “FC” in fact stands for “Football Club” ) joined Major League Soccer in 2007. Altidore has also been the player we not well informed but well intentioned local Toronto FC admirers have heard the most about on TV — perhaps because he has been so good in 2017. We who live here know only too well that Toronto is not exactly the greatest city in the world. But we love Altidore for saying so anyway. He deserves to be at least as big a local hero as the Toronto Argonaut quarterback from far northern California, Ricky Ray. Anyway, my own hat is off to both the Toronto Argonauts led by Ricky Ray and the Toronto FC led by Jozy Altidore — and all the local fans and supporters, who have helped inspire both teams.